As I drove towards the Centennial Arena during Valley East Days, I couldn’t help notice the bright colourful umbrella and tables on the lawn at the corner of Laurier and Centennial Drive . Being curious, and always on the lookout for a good story, so I stopped and investigated. 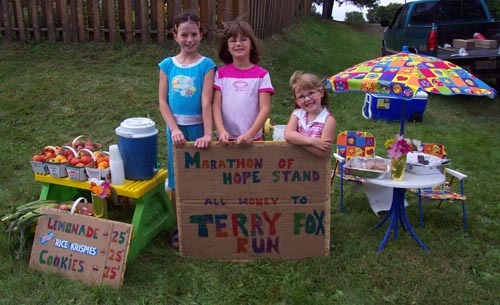 After speaking to Chris Hein, the father of two of the girls operating the stand, I found out that one day recently, Chris was having a normal everyday discussion with his daughters, Jamie, 4, on the far right in the photo, and Brooklyne, 6, in the middle, when the girls told him that they wanted to help people who had cancer. As I went back to my car with my wrapped up piece of rice crispies square, I wondered how many others who saw these three cute little girls that day recalled a life when lemonade stands and sitting on the grass all afternoon were the norm rather than the exception. The last thing I saw when I pulled away was the bright smile from Jamie who showed sincere appreciation for my support of her lemonade stand. She may never realize that what she handed me was much more than simply a piece of dessert – she gave me a chance to remember a time that I had almost forgotten. Thank you girls.